I found that the registration fee for an organized ride in the United States, the Netherlands and Belgium does not include an event jersey. Most events had jerseys that you had to buy separately. 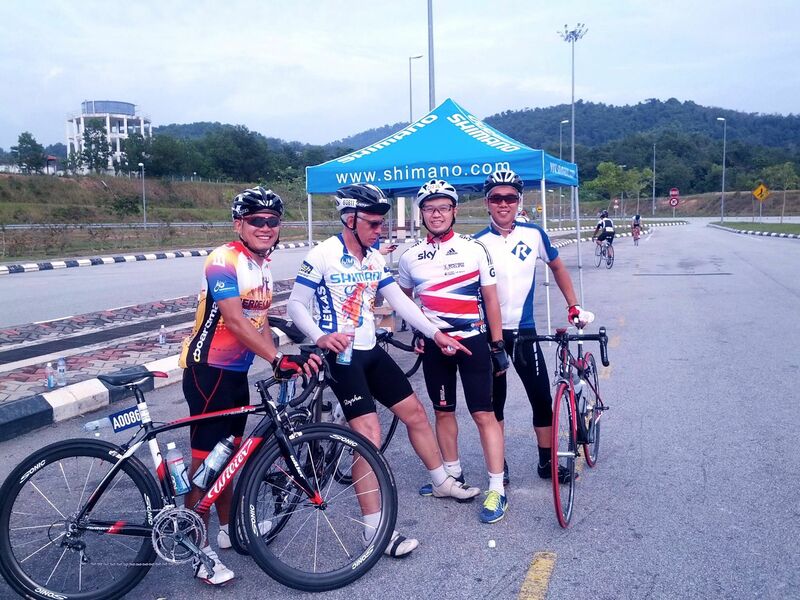 The registration fee for organised rides in Malaysia generally does include an event jersey. My cycling kit storage box is starting to overflow with jerseys. Some nicer than others, as you will see. 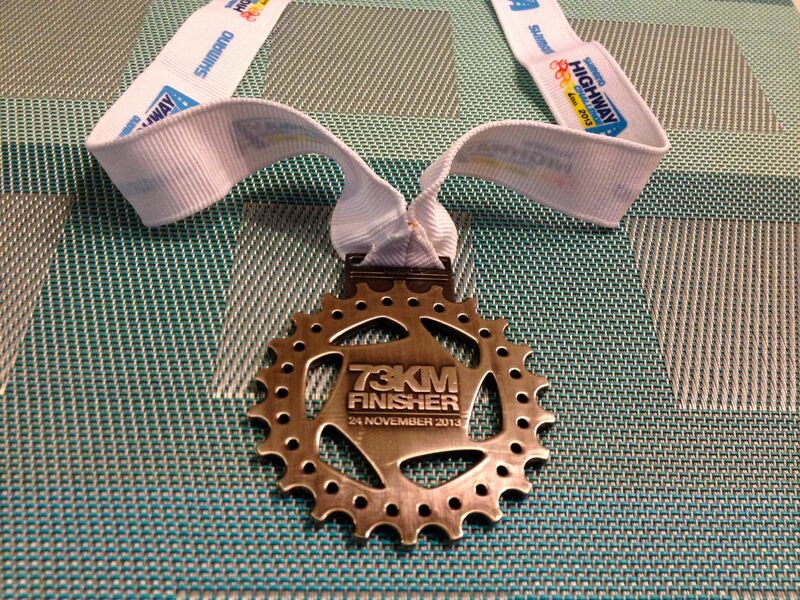 My first Malaysian event jersey was courtesy of the Bike X ride. That ride was in November 2012. I had been home for a month and a half. I was struggling to get used to the heat and humidity. A short-sleeved jersey seemed like a good idea. A clean design with not a sponsor logo to be seen. 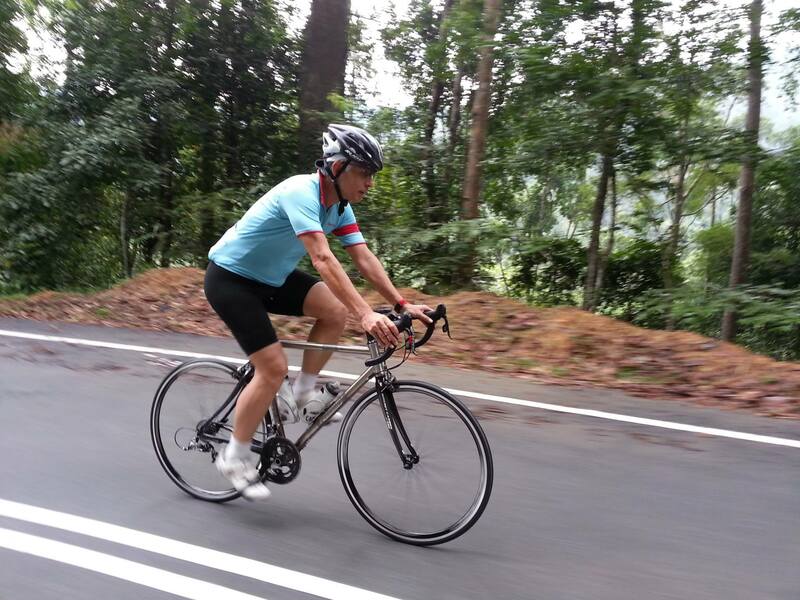 The next jersey came for the Broga Reverse 116 ride, in December 2012. I must not have enjoyed that ride at all. I didn’t blog about it. The jersey has lots of color though. 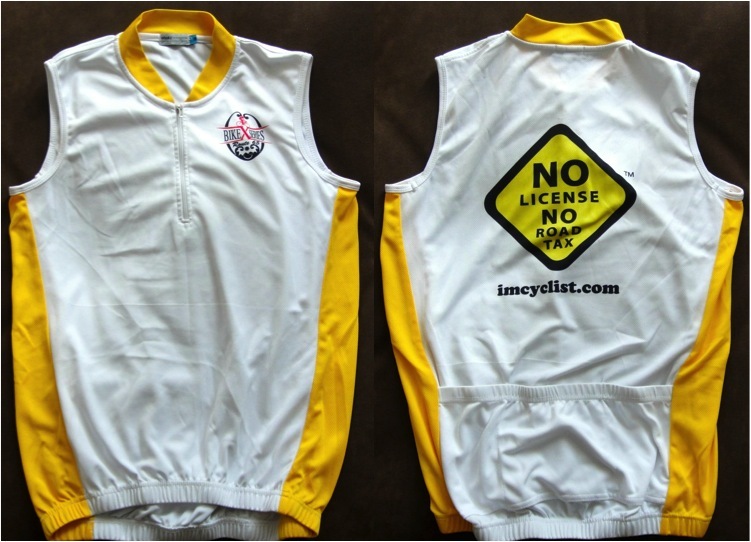 The first jersey of 2013 came from the OCBC Cycle Malaysia ride in January. No fancy graphics for this bank, but lots of sponsor logos. 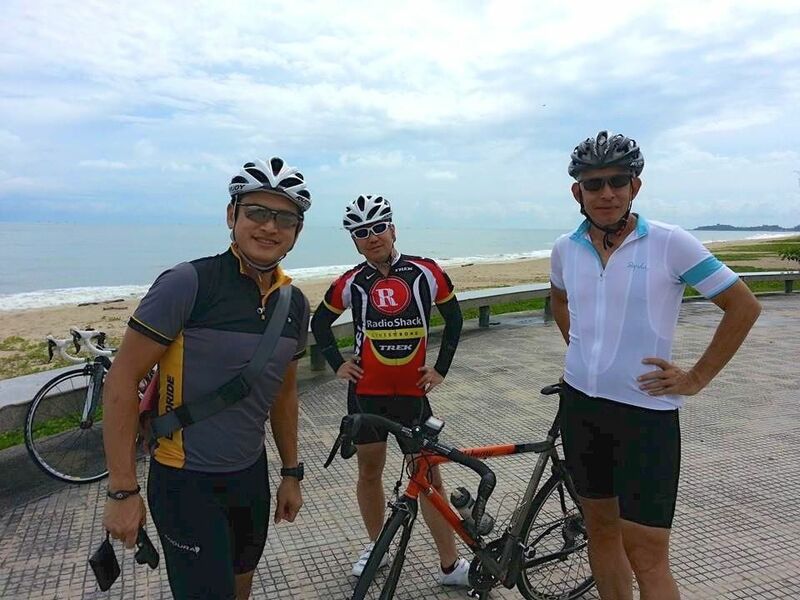 Team 165 rode the Kuantan Century in June. I like this color combination. 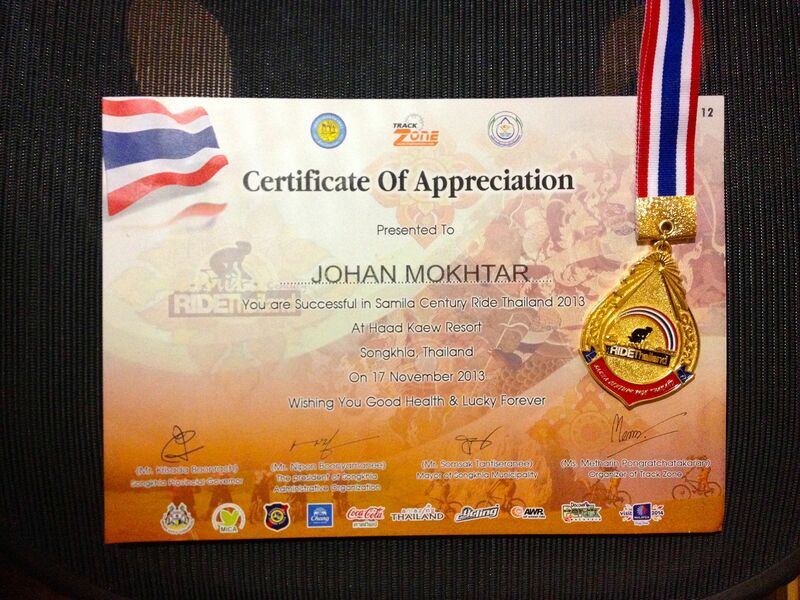 There were an unlucky few who did not get a jersey at the Iskandar Johor ride in July. This ride was notable for its poor organization. Everything about the ride was a bit messy. Like the jersey. 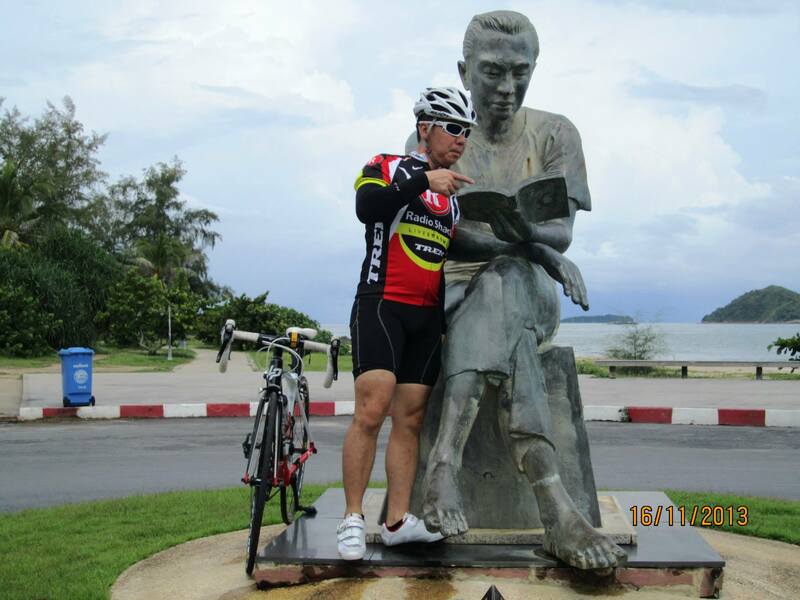 In September we did the Terengganu Century. I like this jersey. The turtle logo for the “Visit Terengganu 2013” campaign is clever. 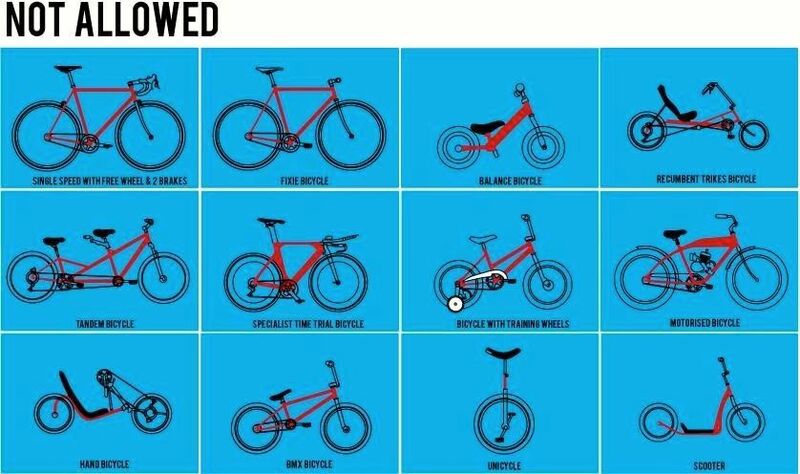 I also like the graphic of the cyclist. 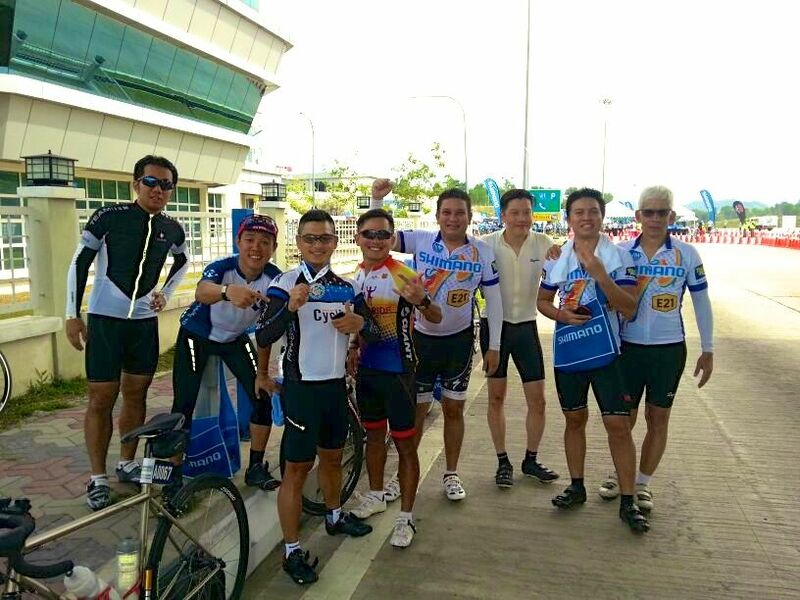 We were supposed to do the Merdeka – 2nd Penang Bridge ride in September. 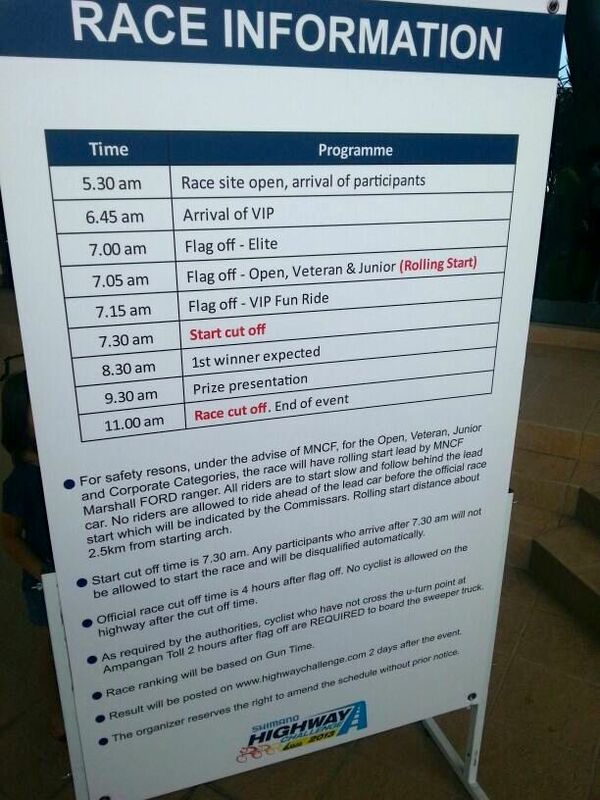 That ride was postponed to November, and then postponed again to a date to be announced. I got the jersey anyway. Is it just me or do the rides with the poorest organization also have the most “graphics gone wild” jerseys? 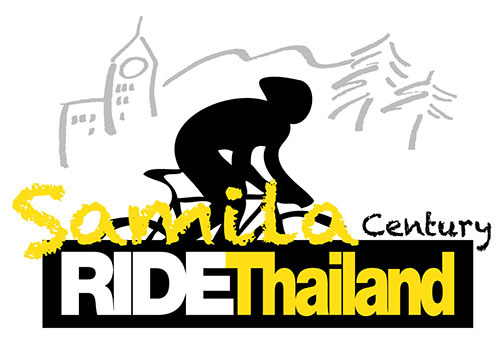 November saw our trip to Thailand for the Samila Century. Not of course a Malaysian ride, but it came with a jersey just the same. The next addition was from the Shimano Highway Challenge. 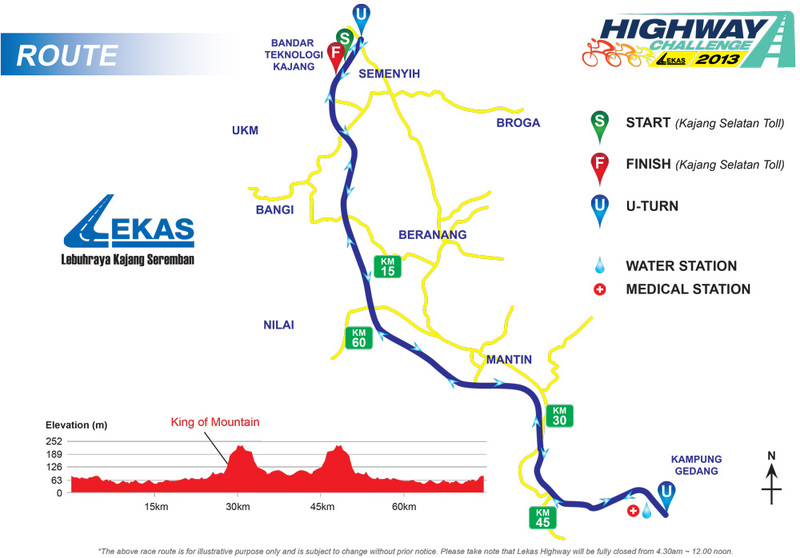 “E21” is the designation for the LEKAS Highway, where the event was run. The last jersey for the year came from the Cycle for Life ride in December. It is quite a smart design. Eleven new jerseys for the year! 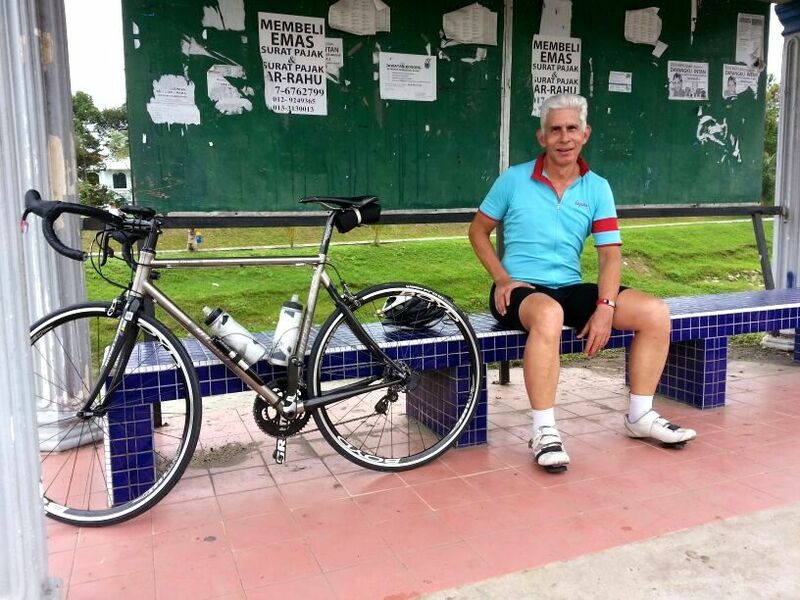 Posted in Cycling in Malaysia and tagged Bike X, Broga Reverse 116, Iskandar Johor, Jersey, Kuantan Century, Merdeka 2nd Penang Bridge, OCBC Cycle Malaysia, Organised ride, Samila Century, Shimano Highway Challenge, Terengganu Century. Bookmark the permalink. My riding buddies and I had been looking forward to this ride ever since it was announced. 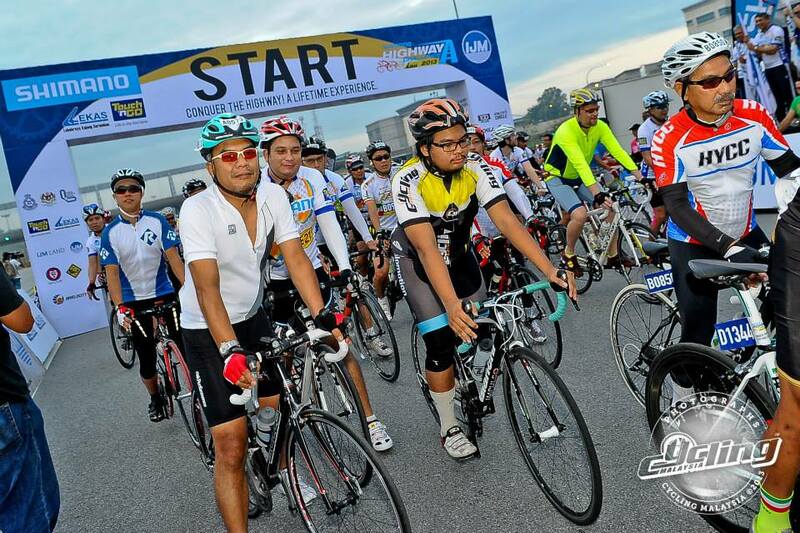 The full length of the Kajang – Seremban Highway (LEKAS Highway) would be closed for the morning so that 1,500 cyclists could ride from the Kajang South toll plaza to the Ampangan toll plaza and back again. 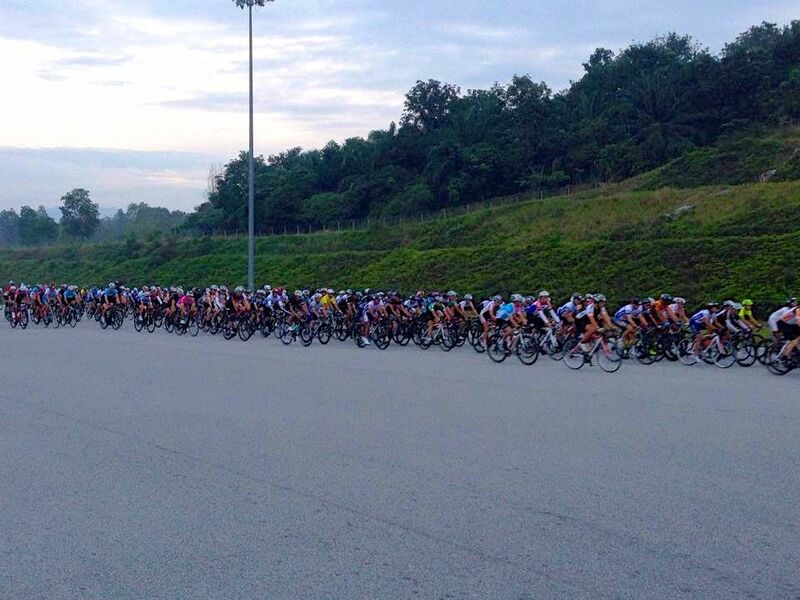 As far as I know this was the first time in Malaysia that an entire expressway has been closed for a cycling event. 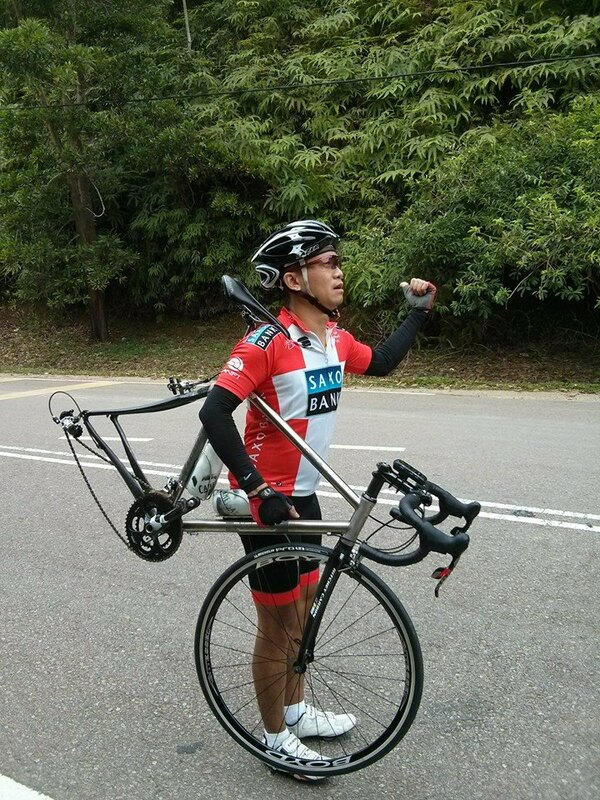 We drove to the Kajang South toll plaza on Saturday, after our usual morning ride, to pick up our race packs. You could tell that there were some major sponsors involved. 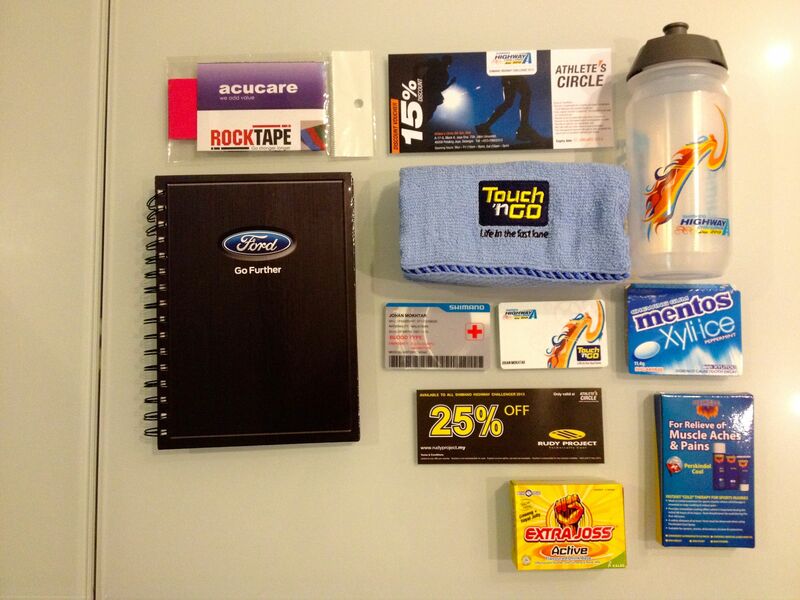 Apart from a jersey and bib and bike numbers, our race packs were loaded with goodies. We got a Tacx bottle. We also got a personalized Touch ‘n Go card. This is a prepaid smart card that can be used as a mode of payment for highway tolls, public transport fares and parking charges. Shimano provided a medical identification card. Ford contributed an annual planner. That Rudy Project 25% discount voucher is already burning a hole in my pocket. One sign of a well-organized event is the quality of information provided to participants. It was very clear what you could ride in the event, and what you could not. 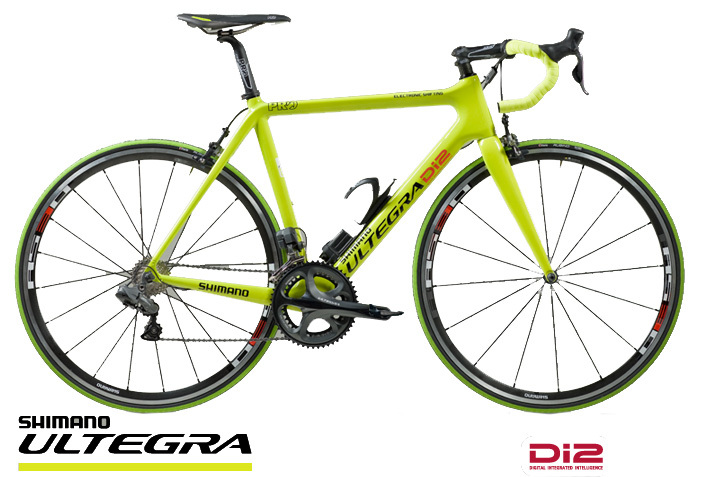 I’m not sure if it was purely coincidental that Shimano were displaying some of these yellow Di2 demonstration bikes. Perhaps just in case someone thought that only yellow bikes would be allowed. We were very impressed that the organizers expected to see the winning riders at the finish ninety minutes after that event started. That would require an average speed of a mere 49.3 kph / 30.6 mph. We started gathering at the parking area behind the Kajang South toll plaza at 5.30am on Sunday morning. Takeaway breakfasts and coffee were consumed while we pulled on jerseys and cycling shoes. At 6.30am we rolled down to the start. Shahfiq, Chris and Mark made up a third of our group. Shahfiq, Marco (behind Chris’ right shoulder, Chris, Mark (behind Chris’ left shoulder, Raj and I rolling under the start gantry and out on to the course. We headed north from the start at the Kajang South toll plaza to the Kajang South interchange. We looped around the cloverleaf to get to the southbound lanes for the first half of the course. We had the entire highway to ourselves, but I suppose force of habit kept riders largely on the left side of the road. We positioned ourselves at the back of the pack to stay out of the way of the elite riders and anyone else who was in the event to race. Once we had a few kilometers under our wheels the pack had thinned out and we had plenty of space. It helps to have three lanes of roadway to play with. It was a gently rolling course, so we were able to keep our speed fairly high. Except for on the King of the Mountain section, which was a three kilometer climb with about 120 meters / 394 feet of elevation. The payoff was a near 70 kph / 43 mph blast down the other side of the hill. There was a water stop on the northbound side of the Ampangan toll plaza, just after the midpoint U-turn. We ran into Chean Kye at the stop. He is more of a runner than a cyclist. As you can probably tell by his shoes. After regrouping and catching our breath we headed back up the Gunung Mantin-Seremban hill to the Setul toll plaza, which is the highest toll plaza in Malaysia. From the Setul toll plaza it was another dash down the hill and then over the rolling terrain of the last 20 km / 12 mi or so to the finish. The weather had been kind to us for most of the morning, staying overcast and relatively cool. The sun did come out toward the end of the ride, raising the temperature. So I was very glad to see this van amongst the tents in the finishing area. 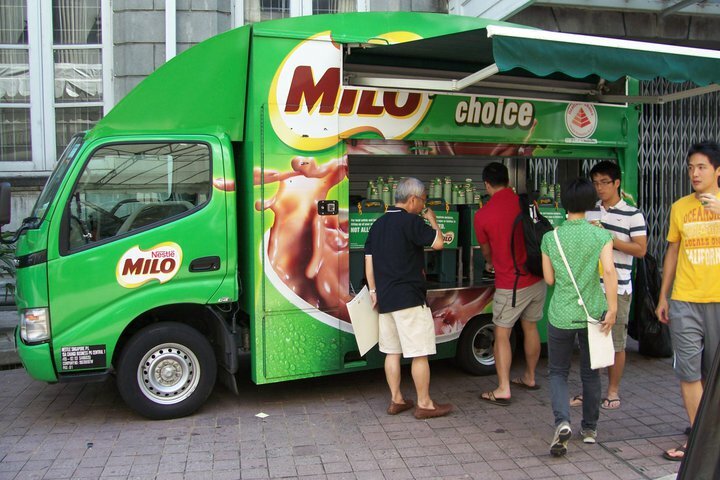 This brought back memories of my primary and secondary school days, when the Milo van was a fixture at school sports meets. The Milo served this morning was as cold, sweet and thick as I remember. And it still comes in small paper cups. I had ten of them. Which meant that I was then too full to sample the satay, ice cream and whatever else was on offer in the finishing area. After guzzling down all that Milo I made my way to the shade of the toll plaza, where the early finishers amongst us waited for the rest of the group. 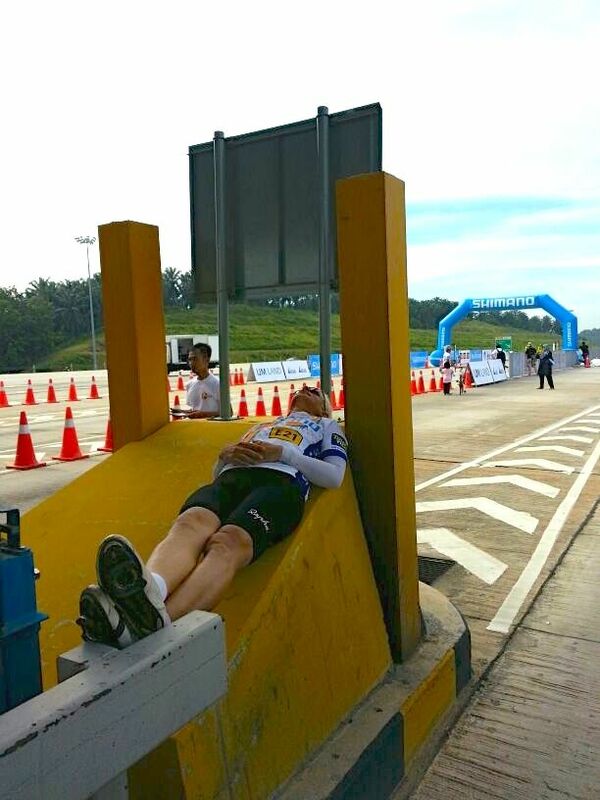 I took advantage of the closed highway and had a bit of a rest on one of the concrete barriers that protects the toll booths from being run into by wayward vehicles. Here is the full crew at the toll plaza after the finish, minus one. Griffin, Chris, Marco, Mark, Raj, Gary, Shahfiq and I. We were missing Azlan, whom we didn’t connect with until after all the photographs had been taken. 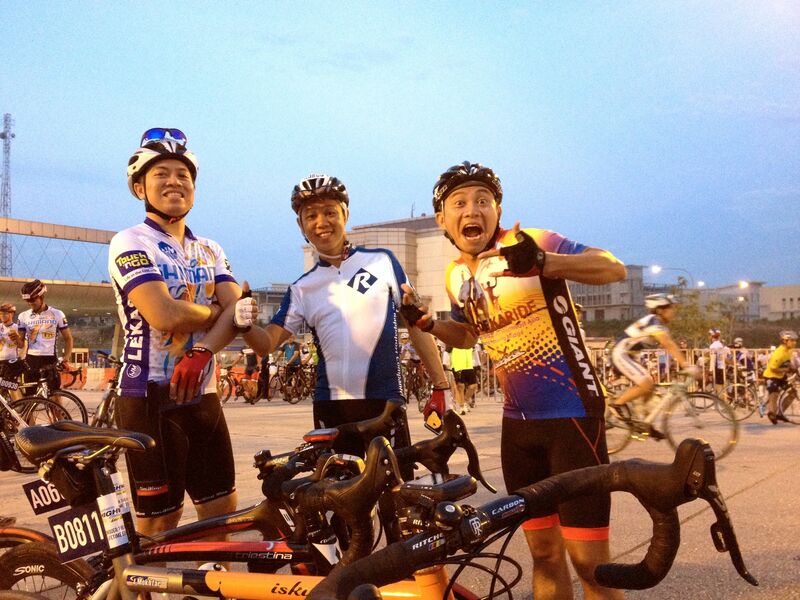 Shimano, the other sponsors and the organizer, High Velocity Events Sdn. Bhd., put on a fabulous Highway Challenge. Everything from the start to the finish of the event was well thought through and flawlessly executed. A new standard has been set for other cycling event sponsors and organizers. We all hope that there will be a 2014 edition of the Highway Challenge. 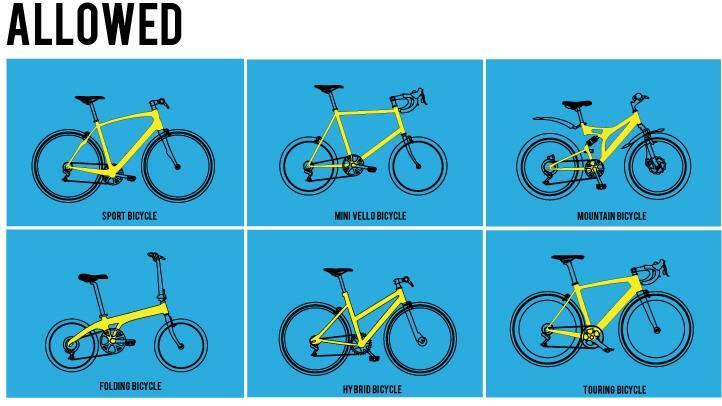 Posted in Cycling in Malaysia and tagged Ford, Kajang South, LEKAS Highway, Milo, Shimano Highway Challenge, Tacx, Touch 'n Go. Bookmark the permalink. We started talking about this ride in August. 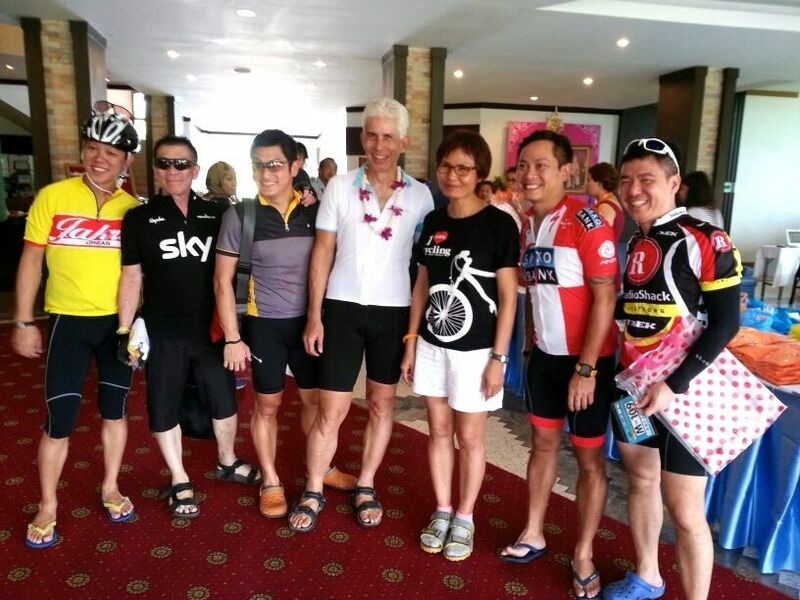 The number of riders in Team KESAS Kruisers fluctuated as Sunday 17th November approached. 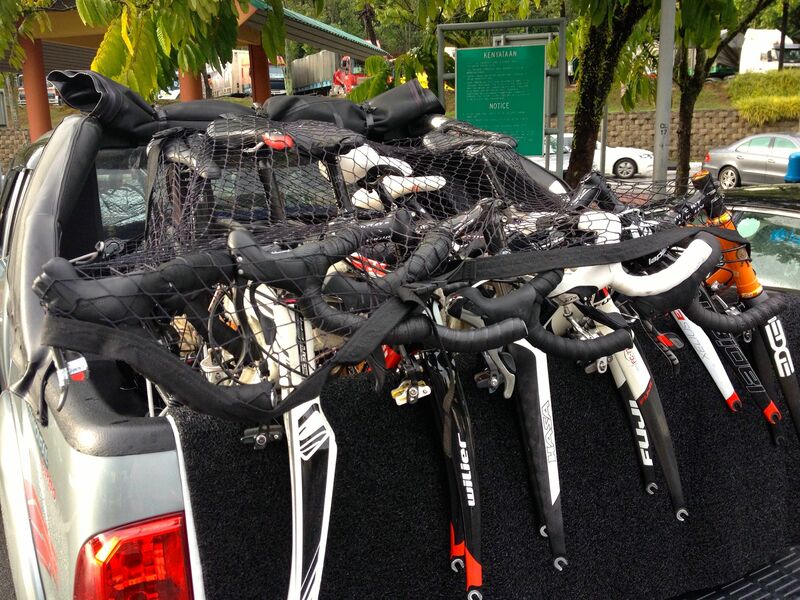 Six of us loaded our bikes into Keat’s pickup truck early Friday morning for the 565 km / 350 mi drive to Songkhla. Keat, Marco and I rode in the truck, and Marvin, Chris and Mark were in Marvin’s hot hatchback. Some planning went into fitting six bicycles into the bed of the pickup truck. Meticulous planning went into deciding where to eat along the way. Breakfast was at the Sungai Buloh R&R. I should be embarrassed to admit that this was only 26 km / 16 mi into our journey. This stop was chosen for convenience over the quality of the food available. The first “foodie” stop was at the Pun Chun Noodle House in Bidor. 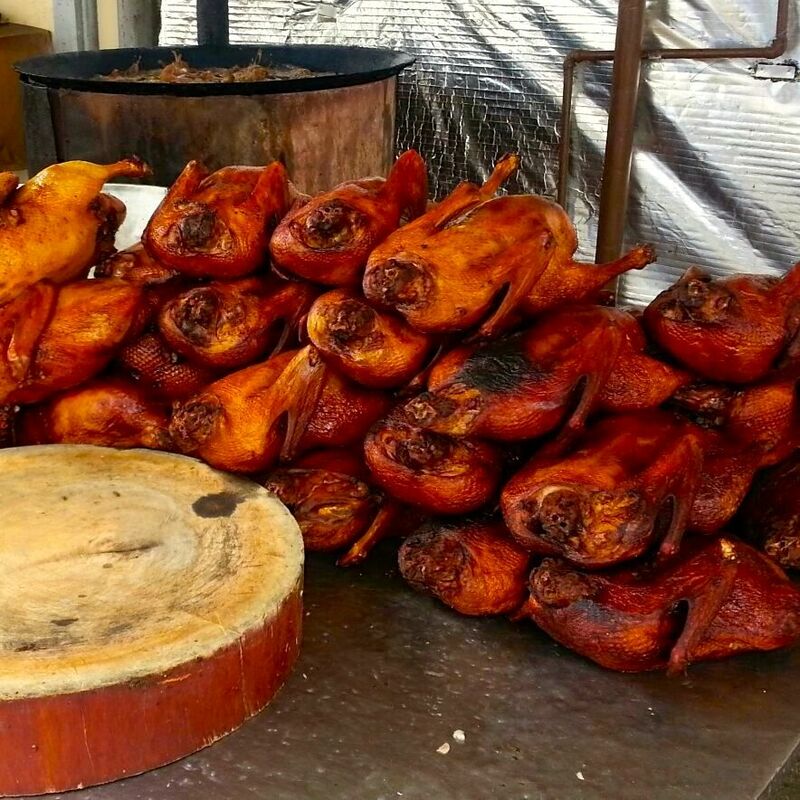 Pun Chun is noted for its duck noodles. They go through a lot of duck! Lunch was at Ong Cheng Huat Seafood in Bagan Lalang. The restaurant is tucked away in a small village. Marvin knew how to get there. The food was outstanding. 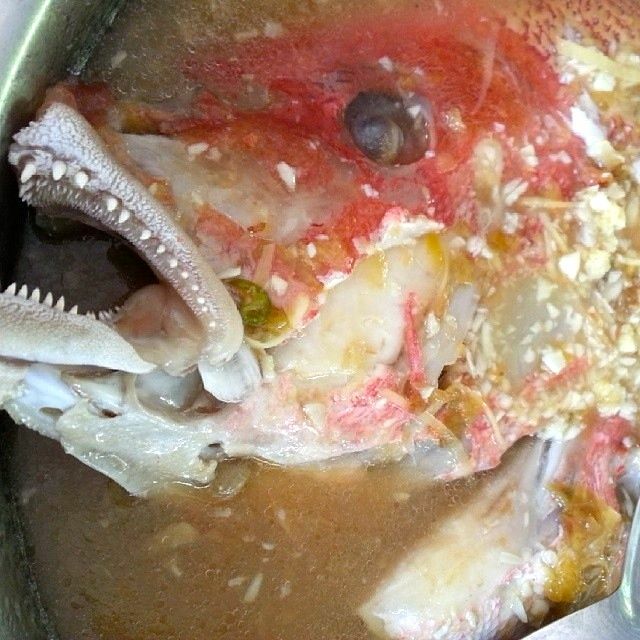 The Steamed Red Snapper was particularly good. This was Keat’s favorite bit of the fish. 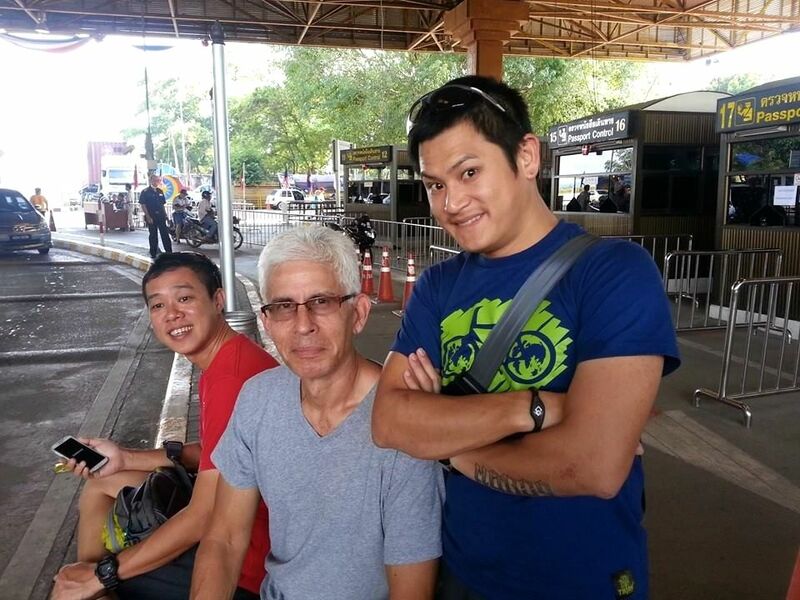 We got to the Thai border at about 4.30 pm Malaysian time. Chris, Marco and I watched the world go by while Keat and Marvin sorted out the paperwork required to drive their vehicles into Thailand. 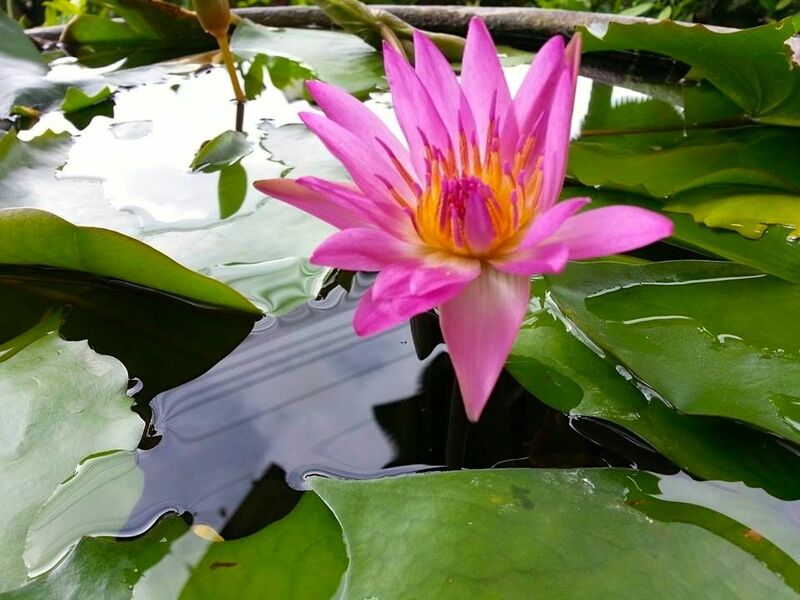 We may have planned our food stops well, but we weren’t so clever when it came to picking the time of day to drive from the border post at Sadao to Hat Yai and on to Songkhla. Thailand is one hour behind Malaysia. It was about 4 pm Thai time by the time we left Sadao. Which meant that we drove into the height of the evening rush outside Hat Yai, and then crawled all the way to Songkhla. The last 95 km / 60 mi of the drive took more than two hours. So it was nice to be in a hotel in the center of Songkhla, within walking distance of places to eat. I wouldn’t go so far as to describe the Pavilion Hotel as “elegant” (see the hotel website). It may well have been elegant in its heyday, but is a bit worse for wear today. It met our needs well enough though. And at RM215 / USD68 per person for three nights, including breakfast, we shouldn’t complain. We wandered into Mr. Steak for dinner. 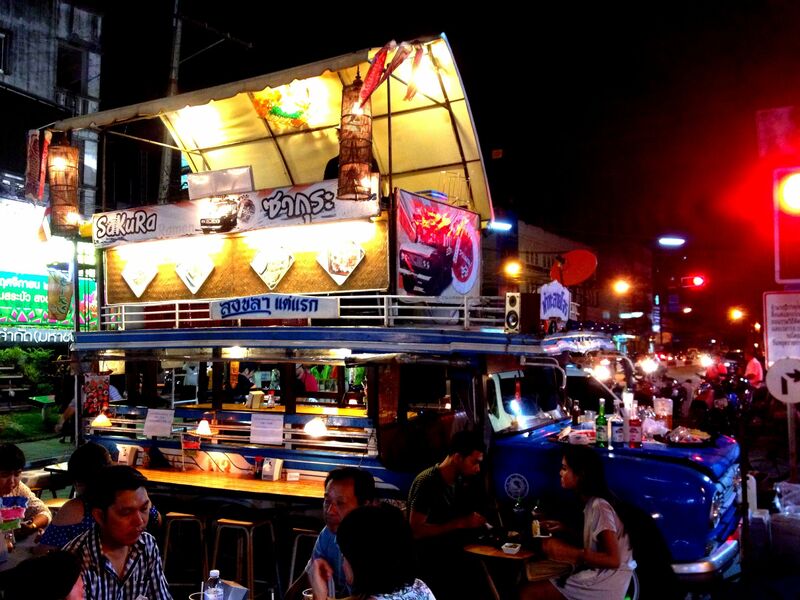 Ribs, steaks and pasta are not what immediately come to mind when you think of what to eat in Thailand. Mr. Steak hit the spot though. This is the team – and a photo bomber! We chose our hotel because it was very close to the official hotel and the start and finish for the ride. 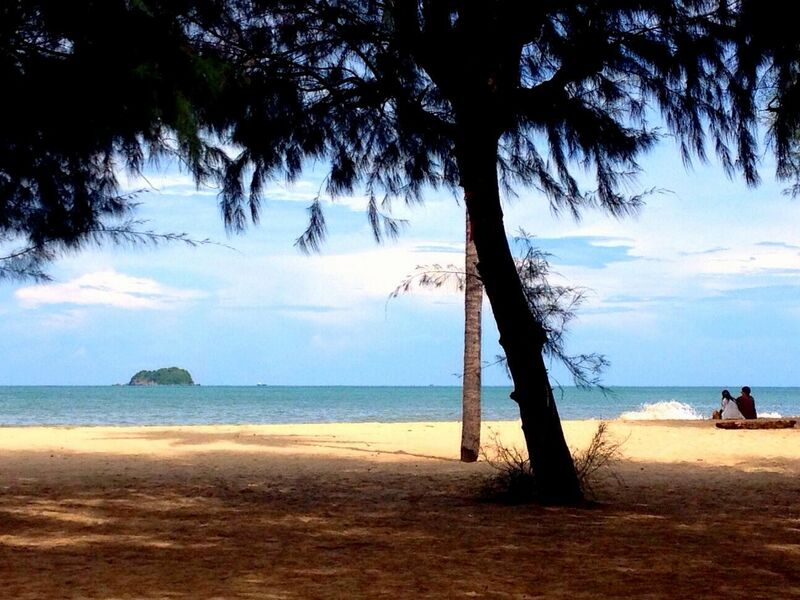 The organizers ran into a last-minute snag with that hotel and had to move everything to the Haad Kaew Resort. 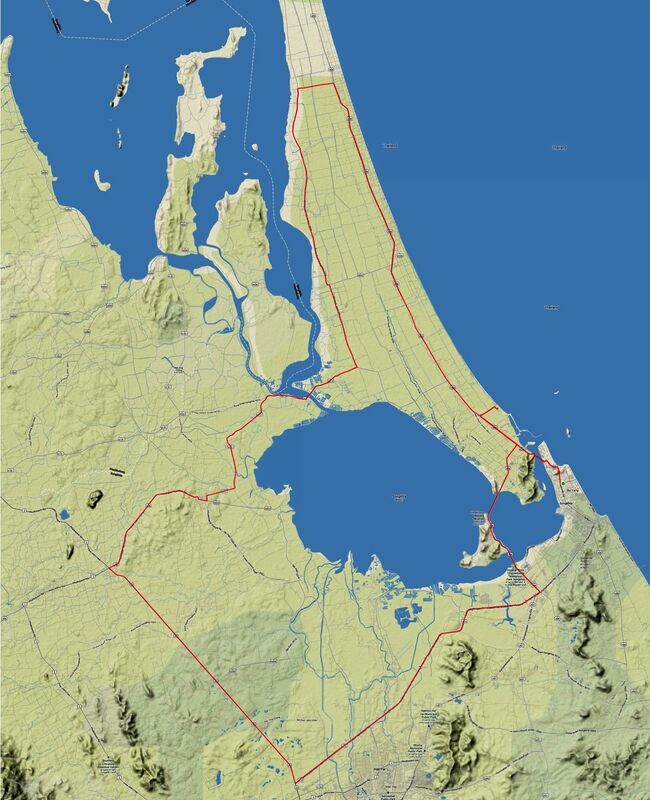 Which is about 30 km / 19 mi away via the two parts of the Tinsulanonda Bridge that join the mainland to Ko Yo Island in Songkhla Lake. Or 10 km / 6 mi away if you take the ferry across the narrow strait that connects the lake to the Gulf of Thailand. We weren’t able to cancel our reservations at the Pavilion Hotel. So the plan was to cycle from the hotel to where the ride would start. 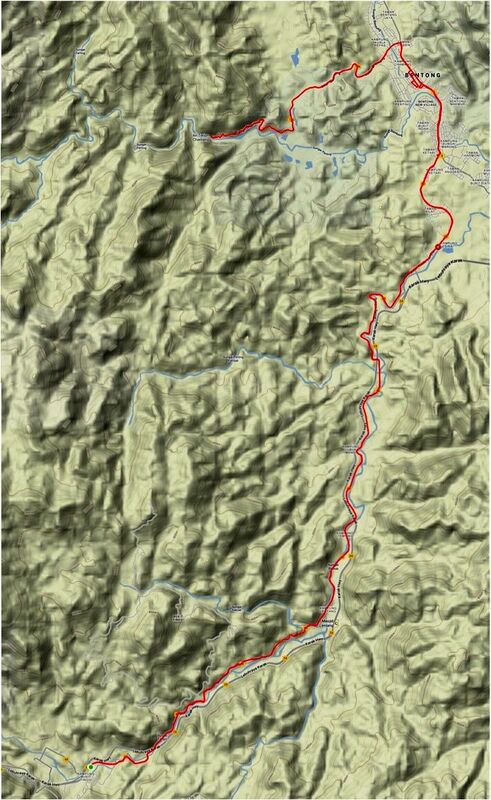 Hence the first order of business after breakfast on Saturday was to recce the shorter route to the Haad Kaew Resort. On the way to the ferry we explored a little. There is a well-known statue, the Golden Mermaid, on Samila Beach. This statue, dedicated to knowledge, looked more interesting to Marvin. The scenic route to the ferry runs along the beach. Marco, Marvin and I, and the others, took turns being photographed with the sea behind us. We had to do a bit of deciphering of signs along the way, but we found the ferry. The ferry operates from 5am, which meant that we would have no problem getting to the start before 7am. An added bonus is that the ferry is free for cyclists. 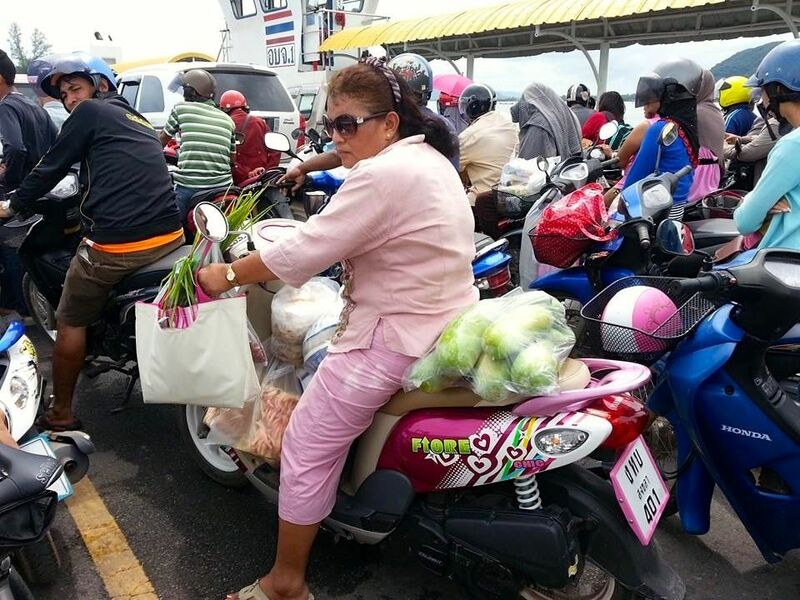 We shared the ferry with a few cars and pickup trucks, and a lot of small motorcycles and scooters. 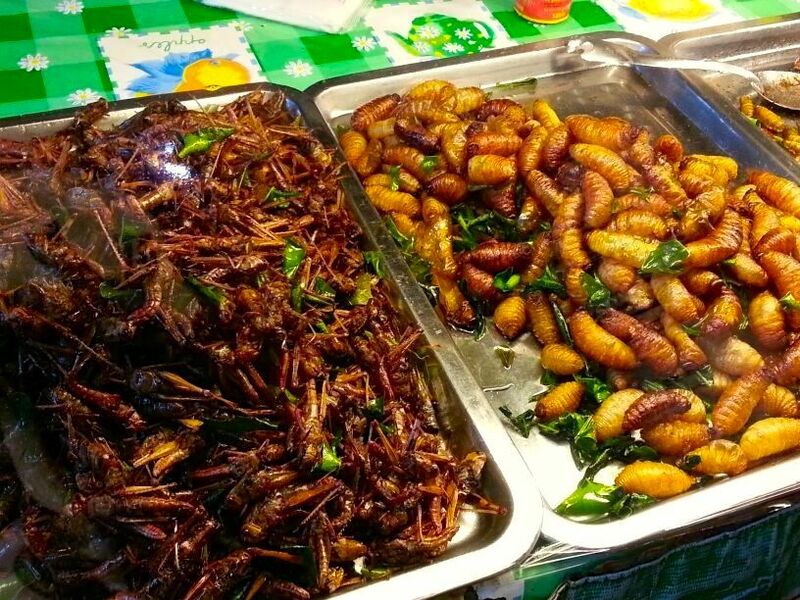 One family was going to have chicken feet, prawns, and squash for lunch or dinner. Once off the ferry we were cycling along the tail end of the ride route, so there were arrows guiding us to the Haad Kaew Resort. Where we discovered that the Samila Century Ride was the shorter option. 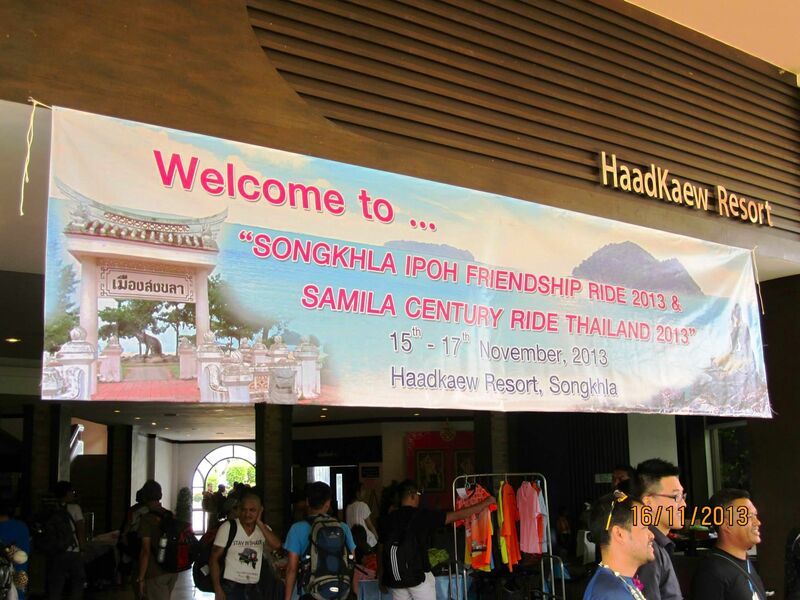 The Songkhla Ipoh Friendship Ride had started the day before. 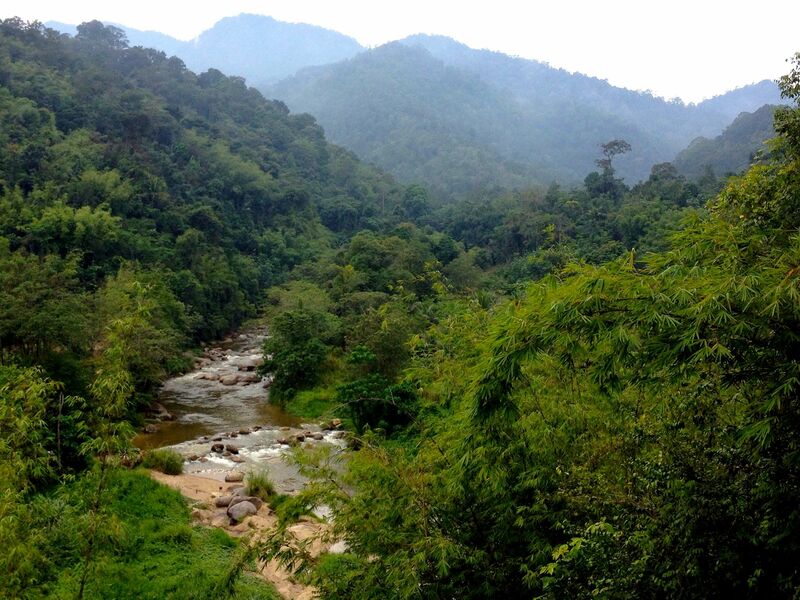 It is about 360 km / 224 mi from Songkhla to Ipoh in Malaysia. Our jerseys and ride numbers were waiting for us when we got there. We introduced ourselves to the event organizer, Ms. Metharin Pongratchatakaran. As for our footwear. We thought it was going to rain and didn’t want to risk getting our cycling shoes wet. The sandals worked out well. We were all a bit peckish by the time we got off the ferry back across the strait. There are a host of seafood restaurants to choose from on Samila Beach. It was time for some Thai food. 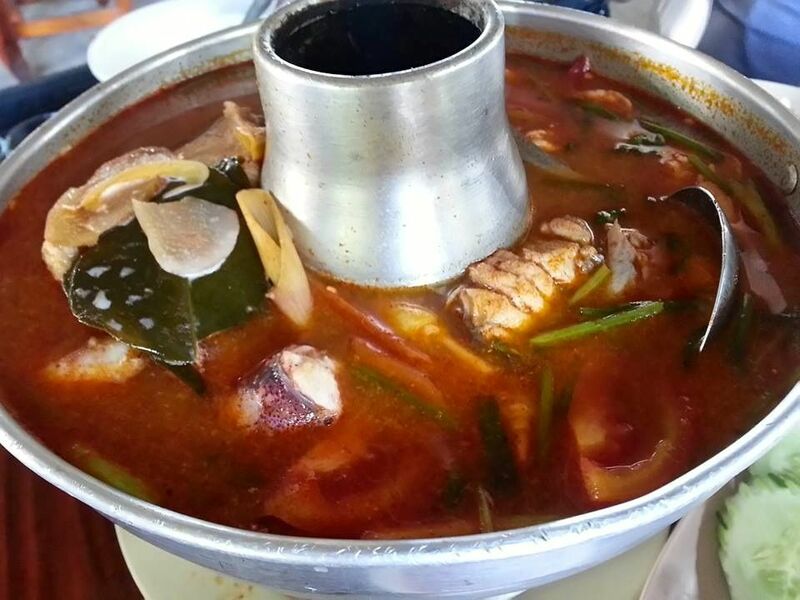 Food doesn’t come more Thai than tom yam soup. I’m surprised we could ride our bikes the rest of the way back to the hotel after all the seafood we ate for lunch. I’m not surprised that everyone took a long nap that afternoon. That evening we wandered through the night market that is just down the road from the hotel. To be more accurate we wandered through the food section of the night market. We didn’t bother with the part where you can buy clothes, alarm clocks, toys etc. The first thing we saw was a pickup truck that had been converted into a Japanese restaurant. Two cooks were in the kitchen on the roof. The diners sat at tables on the bed, or at tables that folded out from either side of the truck. Food came down from the kitchen on a small electrically-operated lift. All quite ingenious. 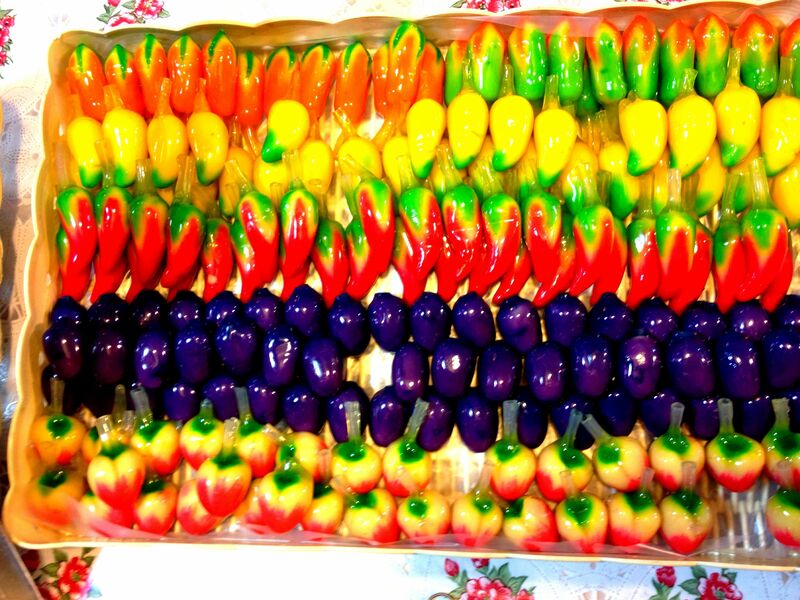 These sweets are called Look Choop. They could substitute for energy chews. They certainly look prettier than your average Clif Shot Blok. Sweetened mung bean paste is moulded to look like fruits and vegetables. A candy glaze adds color. I’m not so sure these treats will catch on as a substitute for energy chews though. Still on the subject of food (no munchies no ride)! The Pavilion Hotel may no longer be elegant, but they do start serving breakfast at 5am. So we had no problem fueling up before our 6.15 am departure from the hotel. We rode out into a drizzle, which eased by the time we reached the ferry. 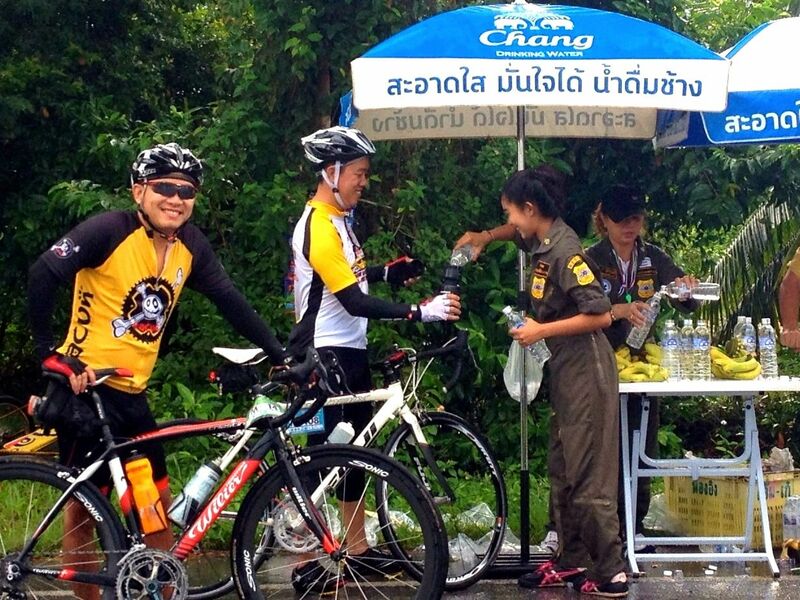 We got to the start outside the Haad Kaew Resort just as it started drizzling again. The rain got steadily heavier and heavier. By the time we were 30 km / 20 mi into the ride it was pouring. So much for wearing sandals the day before to keep our shoes dry. We rode in the rain for the first third of the ride, which took us north along the coast before turning inland and then back south. Highway 408 is excellent for cycling. The road surface is amazingly smooth. Not a bump or a pothole to be found. Despite the heavy rain there was rarely any standing water on that road. The rural road inland is another story. There are lots of bumps and potholes. The rain made riding quite tricky because standing water often hid holes in the road surface. Keat hit a pothole and has seven stitches in his elbow to show for it. He won the hard man award for cycling some 90 km / 56 mi with a gashed elbow, a scraped knee and a bruised hip. Keat’s mishap aside, we were all glad that it rained. The rain kept us cool. By the time we made our first stop at the halfway point the rain had ceased however, and the sun was peeking through the clouds. Mark and Chris are all smiles here. The heat and the headwind in the final kilometers wiped those smiles off their faces. We made a stop at a 7-11 in Khuang Niang. Keat caught up with us there, which is when we learned of his accident. Marvin had stopped early on for what we thought was a loose quick release skewer. He actually had a flat. It took him a long time in the pouring rain to replace the tube. We didn’t see him again until the finish. I bought chocolate milk and chocolate chip cookies. The others bought food and drink also. While we were standing outside the 7-11 consuming our purchases a procession came by. 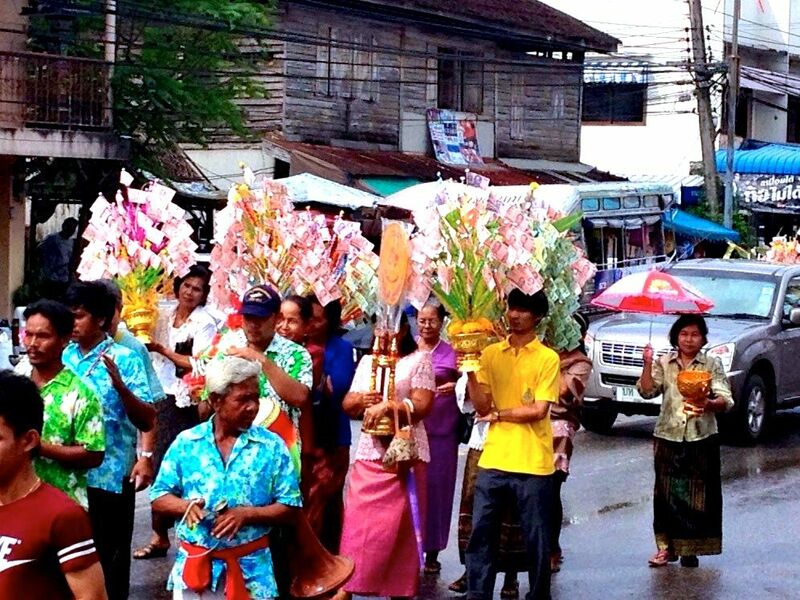 My guess is that it was a wedding procession because of these money trees in their gold pots. Not long after the stop at Khuang Niang we turned left onto Highway 43. The road surface improved markedly. More importantly there was a wide shoulder to ride on so we could stay as far as possible from the speeding cars, lorries and buses. It helped that the highway was arrow-straight for a good 20 km / 12 mi. We made a final stop at a petrol station just after the right turn off Highway 43 and onto Lopbun Ramesuan Road. We needed a rest room. While we were there we took advantage of a water hose to rinse the sweat off our faces, to soak our hair and jerseys in an effort to cool down, and to wash the sand and mud off our bikes. The highlight of the ride for Mark and I came a few kilometers after we made the left turn back onto Highway 408. There was quite a strong headwind as we rode over the first part of the Tinsulanonda Bridge. We had our heads down, pushing against the wind as we rode past Wat Pranon Laem Pho. So we didn’t fully appreciate the large reclining Buddha that the temple is famous for. About halfway across Ko Yo Island something like this rolled past us. 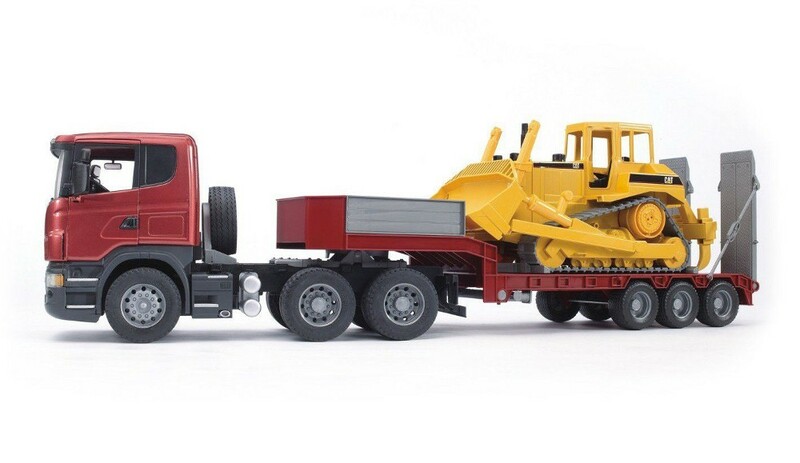 Mark and I had drafted a lorry once before. What a blast that had been! This was too good an opportunity to pass up. Especially given the headwind we were battling. We swung to the right and accelerated into the still air about 1 meter / 3 feet behind the lorry. For the next 5.5 km / 3.4 mi we averaged 54 kph / 33.5 mph. As we came off the second part of the Tinsulanonda Bridge and onto the mainland we were exceeding 64 kph / 40 mph. What a treat to run out of gears on the high end of the cassette for once. Sadly this low-loader wasn’t going all the way to the Haad Kaew Resort. We waved our thanks to the driver as he honked and turned to the right. Then our normal cycling speeds were resumed for the last 7 km / 4 mi to the finish at the beachside resort. I had expected to wait for the rest of the KESAS Kruisers and then ride back to our hotel. Instead Mark and I were ushered into an air-conditioned hall for a sit-down lunch. Thai green curry, stir-fried vegetables, spicy tofu, chicken in soya sauce. All good, and all much appreciated. Before long our group was together again. As we ate we were were entertained by a singer, and a group of Thai traditional dancers. That was followed by a lucky draw. We all had our numbers in our hands and hope in our hearts, but none of us left with a prize. We did have a certificate and a finisher’s medal to show for our efforts. And memories of a wonderful trip with a first-class group of friends, and a very well-organized ride. I think we will be back in 2014. 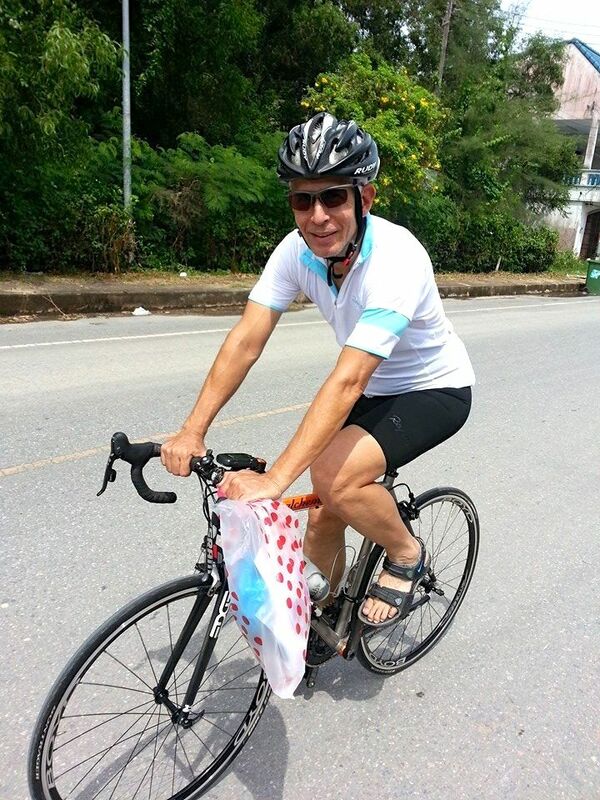 Posted in Cycling in Malaysia and tagged 7-11, Haad Kaew Resort, Hat Yai, Ko Yo Island, Ong Cheng Huat, Pavilion Hotel, Pun Chun, Rain, Samila, Samila Beach, Songkhla, Thailand, Tinsulanonda Bridge, Wat Pranon Laem Pho. Bookmark the permalink. It was the Islamic New Year on 5th November. Like its Gregorian calendar equivalent, the advent of the Islamic new year is marked by a holiday. A holiday to be celebrated with a long bicycle ride. 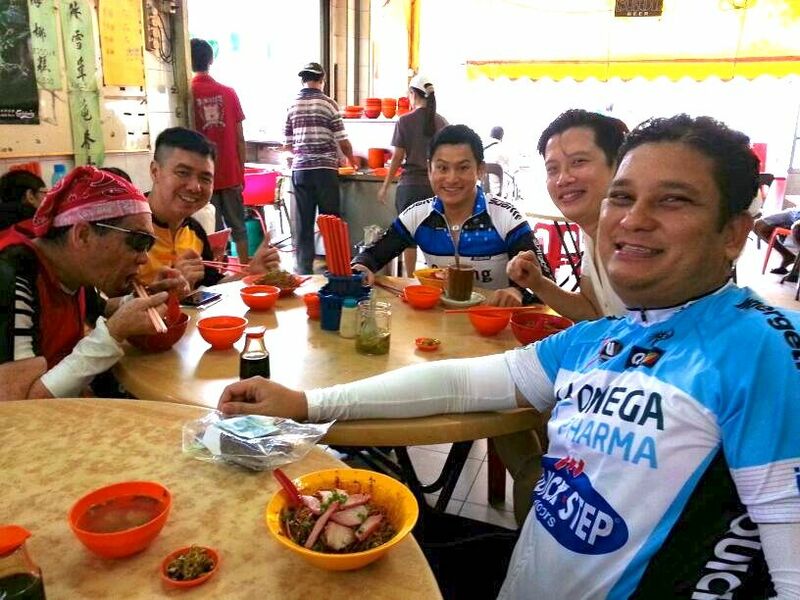 The original plan was to ride from Bukit Tinggi to Bentong, eat beef ball noodles for breakfast, and ride back. Bukit Tinggi is about 300 meters / 980 feet above sea level. Bentong is 95 meters / 312 feet above sea level. The hard work would come on the way back. Nine of us, including birthday boy Raj, pointed our bikes downhill and rolled through the light rain. The wet weather soon moved on toward Kuala Lumpur, leaving us on damp roads but under overcast skies. There would be no need for arm coolers and suntan lotion. We swung into Bentong after about an hour. Only to find that the famed beef ball noodles shop was closed. So we embarked on a spin around the town looking for an alternative. We ended up at the wonton noodles shop where we had stopped during the Durian Fiesta ride. Which suited the birthday boy. 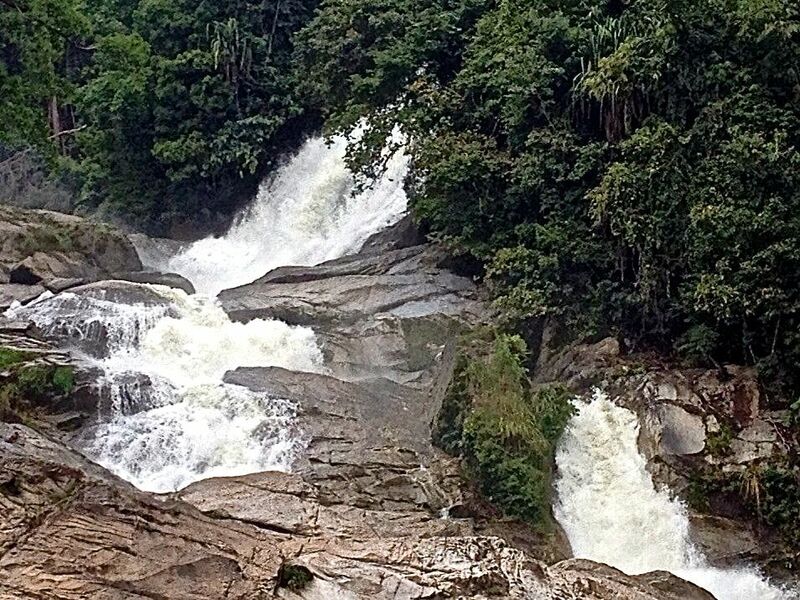 Everyone was so refreshed after breakfast that we decided to continue on to the Chamang waterfall. The waterfall is very easy to get to. 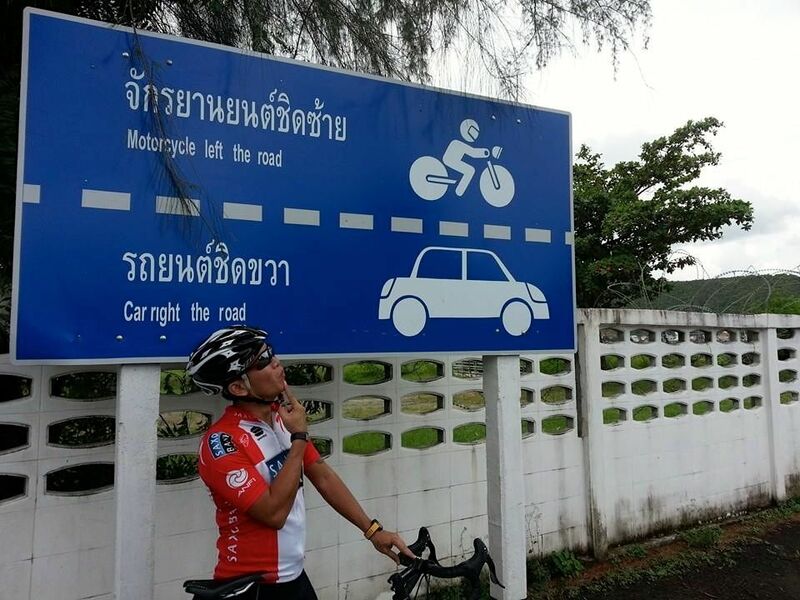 Follow the sign just outside Bentong, and start climbing. Six kilometers into the climb we got our first glimpse of the Perling River. Accompanied by the thwack thwack thwack of cloth against rock. Someone was doing their laundry. The waterfall was worth the 110 meter / 360 feet climb. We all enjoyed spending twenty minutes watching the water cascading down the rock face. Raj is a relatively new roadie. So all credit to him for coming along with us on these longer rides. And being thrilled at the prospect of the climb to come that Griffin and I are pointing out! 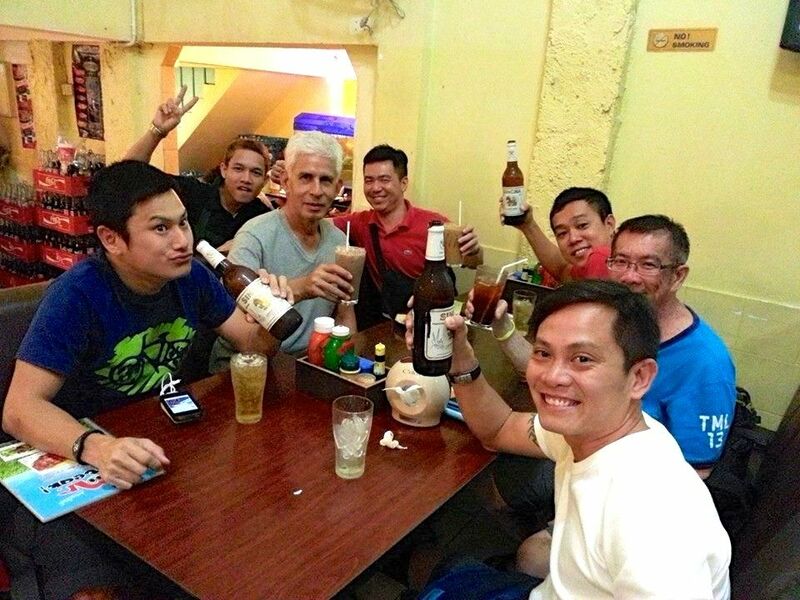 On the way back we made a pitstop in Bentong for drinks and photos. 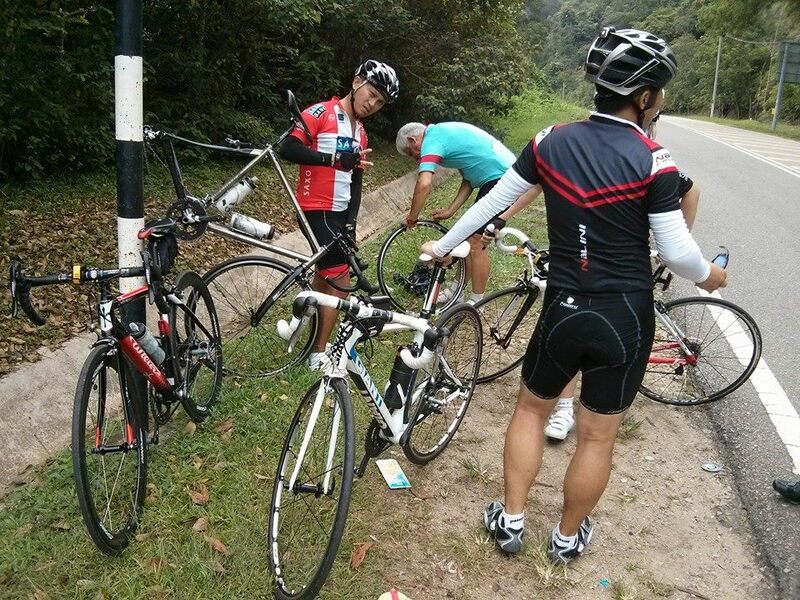 The ride back to Bukit Tinggi was interrupted by two pinch flats. I was a bit surprised to be stopped by a pinch flat on this smooth section of road. Here I am demonstrating my tube-changing skills to a very interested audience. Twenty kilometers later I had another pinch flat. That one was no surprise. I was on a bridge with a lorry right beside me. I had no choice but to ride over a gaping expansion joint. My prayers to the guardian angel of inner tubes were not answered. That didn’t detract from a great morning out with my riding buddies. Great company, good food, cool weather, impressive views, lots of laughter, and when I was in a pinch, Marco had an inner tube to spare. 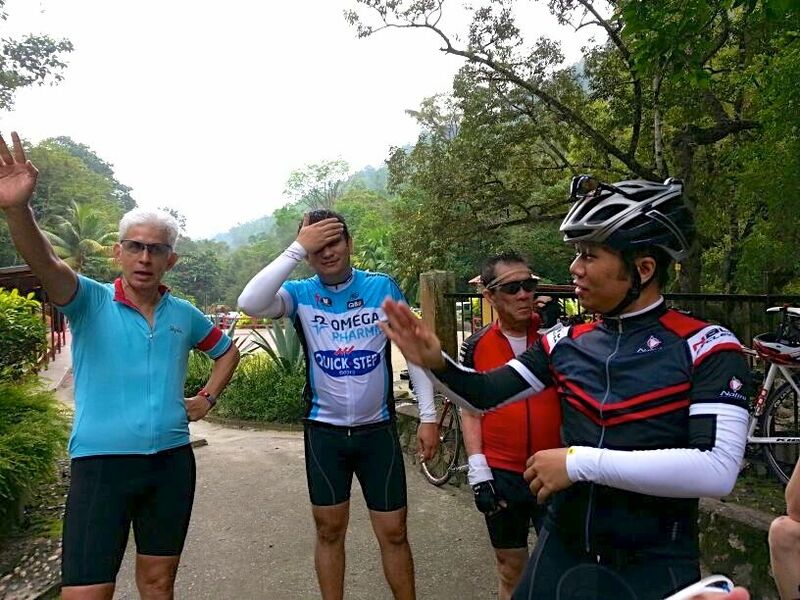 Posted in Cycling in Malaysia and tagged Bentong, Bukit Tinggi, Chamang Waterfall, Perling River, Pinch Flat. Bookmark the permalink.